Posted on September 27, 2010 March 4, 2015 by Sarah R.
A version of this essay was originally posted at http://www.hastac.org/blogs/sarahr/digital-labor-cold-war-roots on February 9, 2010. Doing some reading over the past week, I was prompted to think about, then comment on, a chapter by Friedrich Kittler on Cold War computing technology and the implicit (and explicit) ways in which an examination of so-called “defense technology” comes into direct contact with, and within the purview of, media studies, information studies and labor studies. Specifically, I am interested in uncovering the history of these technologies and their development, particularly when the when many defense technologies have been considered value-neutral or even as beneficial (and perhaps were, particularly when they moved from the province of military applications to consumer or mass-market ones). Additionally, the process of uncovering the hidden labor embedded in digital and computing technologies and processes, is inextricalbly tied to the critically important task of uncovering their hidden agendas, applications and roots within the military-academic-industrial complex1. “The SAGE radar display console seen here presents a picture of the air defense situation within its assigned geographic area. Using buttons and switches on the console, the Air Force Airman First Class who is operating the console can request information to be displayed such as speed, altitude and weapons availability and location, and he can direct action to be taken against an attacker. 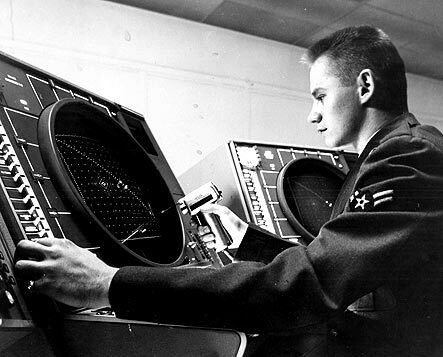 With the light gun in his right hand, the operator selects radar tracks for identification and display on the SAGE Direction Center’s summary board.” Photo Credit: IBM online archive. Fred Turner, in a talk a few weeks ago at the University of Illinois, referenced SAGE, for example, one of the first interlinked computer systems, and part of the U.S military’s DEW (distant early warning) system. Kittler notes, in the same writing, that the Semiautomatic Ground Environment Air Defense System, was conceived as an answer to the Soviet atomic fleet, and it brought us everything todays computer users have come to love: from the monitor to networking to mass storage (182). Many of these military innovations have found direct applications and homes in the civilian sector, a spin-off called information society [that] began with the building of a network that connected sensors (radar), effectors (jet planes), and nodes (computers) (182). Not only, therefore, has the technology developed by the military, in conjunction with partners in academe and industrial R&D, made its way into daily life, but so, too, have basic concepts of organization, processes and structures. Any study endeavoring to undertake an examination of these organisms must therefore absolutely examine ties to other systems, projects and goals, particularly during the technological boom of (and promulgated by) the Cold War. I recently undertook a preliminary (to me) study of a state information system in late 20th century France that was developed for civilians and laypeople in the country2. While this system, popularly known as the Minitel, was fundamentally implemented for the populace at large, by tracing the policy development and goals at the root of the creation of the system, I quickly discovered that military and national sovereignty concerns were, in fact, at the core of this massive national technology project. In fact, a desire to be able to calculate nuclear strikes and impacts in simulation on IBM mainframe computers drove then-president and erstwhile war hero Charles de Gaulle to institute a state information policy where previously there had been none. To this end, Kittler’s comment that since 1941, wars no longer needed men, whether as heroes or as spies, but were victories of machines over other machines (182) does not seem like much of a reach at all. And just as Cold War soldiers unleashed A-bombs on Pacific atolls, physically divorced from their literal and figurative impact, todays drone pilots unleashing shock and awe in Afghanistan (raised on Xbox 360 information-processing and joystick skills) are removed from their targets. Yet, media reports are flooding in suggesting that these virtual bombardiers are experiencing very real PTSD3. How do virtuality and reality blend with technology and morality in this new brand of warfare? And what does it mean when our warfare resembles our gaming, and in our games we play soldiers for fun, on networked hardware running simulations on the one-time DoD project known ARPAnet and now known as the Internet4? 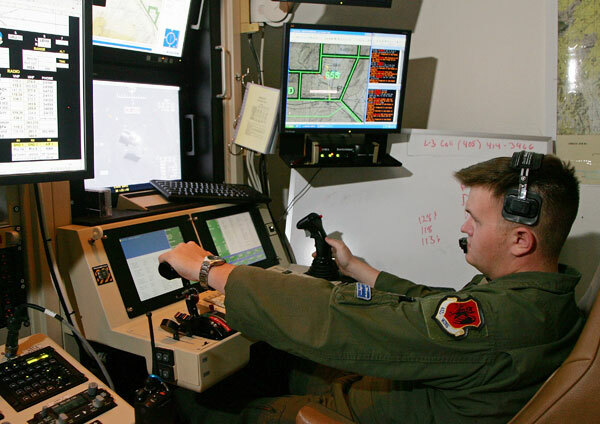 Contemporary drone piloting and command, 2009. 1. To this end, Carlos Alberto Scolari provided a great deal of context and support, suggesting that new generations of Internet and digital media scholars can provide the framework for examinations of technology in these complex areas of inquiry. 2. The Minitel system was developed and implemented in the 1970s-1990s and comprised of the nationalized telephone network, hardware access points and suite of services and information tailored to its French userbase. It was conceived as and constituted a digital Maginot Line against capital extraction, economic dominance and cultural hegemony from transnational corporations based in the United States, Japan and elsewhere. 3. See http://www.msnbc.msn.com/id/26078087/ , http://www.gearfuse.com/army-drone-pilots-suffer-from-combat-stress/ , and http://www.slate.com/id/2197238/ for recent discussion of this topic. Kittler, Friedrich. Cold War Networks or Kaiserstr. 2, Neubabelsberg. In New Media, Old Media: A History and Theory Reader, edited by Wendy Hui Kyong Chun and Thomas Keenan, 181-186. New edition. Routledge, 2005. Scolari, C. A. Mapping conversations about new media: the theoretical field of digital communication. New Media & Society 11, no. 6 (9, 2009): 943-964.